Prime Minister Narendra Modi, who has stepped into the steps of the Parliament before taking a sworn oath, will have the respect of Parliamentary procedures and traditions. 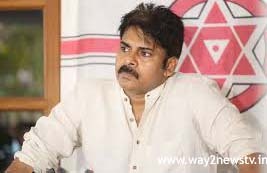 It can be understood that he has not respected parliamentary policies with the way he followed the no-confidence motion, "Jansana President Pawan Kalyan said. The Prime Minister's remark that the Opposition parties did not keep the session of Parliament is not believable. The CPM and CPI leaders met with Pawan Kalyan on Thursday morning at the Jana Sena office in Hyderabad, where the party did not sabotage. The activities of the programs, the Prime Minister, the BJP's initiative and other issues were discussed. Pawan Kalyan said, "Delhi Chief Minister Arvind Kejriwal is not a Left Front governor and the central government is not cooperating with him," he said. If you do not, then you are saying that the Prime Minister is a formidable force. I believe in the faith and the lack of confidence and the loss of that belief.It's a mistake in the issue of special status for Andhra Pradesh and the implementation of the Guarantees of Partition Act, which has led to the error. Except TDP and VCP There is a need for three parties to come to the debate ... now they are doing a protest, "he said. Earlier, the Left leaders had a bitter experience at the Jana's office. Pawan Kalyan has arranged a meeting with leaders of Left parties today. The CPI (M) state secretary, along with two other leaders, came to the Jana's office. As they were going into the office, security personnel hindered them. They said that they have no information regarding the matter. By doing so, they stayed outside the gate or the gate. At the same time, Pawan Kalyan meeting with the leaders of Khammam district is informed. However, Pawan Kalyan, who learned Madhu, came to the police to immediately send them in. Later security personnel took the gates.